Pierre-Louis Augier aka pl6025 for answering the huge amount of emails that arrived on the contribute-fr mailing list , nicely explaining to people what to do if they needed help or wanted to help. Team Aviary.PL for adding localizing Facebook posts in Polish to their Firefox to-do list. Our long-time awesome social media volunteers from Mozilla Hispano, Mozilla PT, Mozilla DE, Mozilla ID. Thanks to all our super teams, we are now posting in 7 languages! Woot! for our social superstars! Jake Watkins (dividehex) and Kim Moir (kmoir) For re-wiring all the panda boards so that they are less flaky! Francisco Picolini (franc), Guillermo López (willyaranda), Rubén Martín (nukeador) & Mozilla Hispano for their support and participation at Saturday's Firefox OS App Workshop in Madrid. Last week's B2G workweek was awesome. Literally. To make that happen, a bunch of invisible prep-work happened. for each of those devices, we generate "nightly" builds twice a day. Once for 8am PDT morning. Once for 8am Madrid CET morning. Stood up an extra 250 slaves. More importantly, created 22 masters in AWS so we now have 70 masters and can quickly burst to create more slaves if needed. Reimaged 80 in-house build & test machines to optimize for Firefox OS development based on recent usage trend. Opened up an alternate to mozilla-inbound; birch allowed b2g-workweek developers a less crowded branch to land on. All those change made a big difference. Last week, 1490 checkins were landed, and all systems held above 90% for the week! Firefox for Android is now on the Yandex.Store! WebRTC ready for testing. Read about flipping the pref. Front-end team is running a UI Hackathon this week. More details and current bug list. Nightly treats: Domain auto-completion in the awesomebar, Caching search terms in the awesomebar and changing the default search provider. 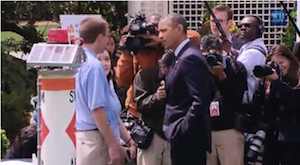 We’re extremely excited to be participating in today’s White House Science Fair — and even more excited to have President Obama help us kick off our new summer-long Maker Party: thousands of community-led events around the world to celebrate the amazing things we can make and learn thanks to the Web. Watch the White House announcement live. Spread the word. By re-tweeting sample tweets like these. Successful workweek in Madrid last week! 9 companies participated, nearly 200 people attended. Next up for 1.0.1 release is certification: IOT, GCF, PTCRB, USB, WiFi, Bluetooth, CE, FCC. Ever wonder what Mozilla IT is or what we do? We keep the lights on. We're like your landlord - when the roof blows off, the ceiling leaks or the outside needs repainting, we do it. But we have no control over the furniture. Sometimes we see tenants on their way in or out or we're called in when they're having a loud party but other than that, we stay out of your way. In other words, "we make sure the house is in good shape but we can always give tips about the indoors." If you want to have a loud party, let us know! We love parties! File under "What you don't see might be more important than what you do see"
Last week Mozilla suffered a huge multi-day outage with our fiber provider between Northern California and Arizona. It took down both fiber connections. Everything failed over to the backup VPN. I bet no one even knew this! John Slater Director of Creative "Plug for upcoming Firefox OS brown bag (and t-shirt giveaway)" San Francisco no screen share -- Stay tuned for more details coming via email. Michelle Thorne Webmaker Mentor Team Maker Party 2013 Mozilla office, Berlin Yes Slides Maker Party 2013 announced today at the White House. Mozilla is hosting a global campaign to celebrate things we can make and learn on the web. Sign up for updates and to get involved. Dino Anderson Organizational Development "Rosetta Stone Relaunch May 1 and 2" San Francisco no screen share Rosetta Stone wiki Look for Rosetta Stone Relaunch reminder in e-mail. Ran Infrastructure load focus group meeting -- more information coming soon w.r.t. what our measurements will show and what we predict various proposed solutions' impact to be. This page was last modified on 1 October 2014, at 17:51.